C NOTE: This Key work by Henry Makow reveals the criminal conspiracy behind the Illuminatzi bankster sponsored Bolshevik / Communist Revolution. However, more importantly it exposes how Freemasons are simply used and murdered once the Illuminatzi leadership has used them. Make sure to also read the Liberty For Life article "Janus the Two-Faced God of War, The Destroyers of Civilization: the Freemason & Catholic Jesuit Two-Faced Gangs of Deceit" a complementary article which delve deeper into the Freemason & Jesuit deception. Incredible and bizarre as it sounds, humanity is indeed the victim of a diabolical conspiracy. War, depression and genocide in the past century were not accidental or inevitable but the result of malevolent design. Shocking evidence is a 1938 Stalinist police (NKVD) interrogation of a founder of the Communist International, Christian G. Rakovsky, 65, who was facing execution for plotting to overthrow Stalin. The 50-page transcript of his interrogation, dubbed "The Red Symphony," was not meant to become public. It confirms that the Rothschild-Illuminati planned to use Communism to establish a world dictatorship of the super rich. This is perhaps the most explosive political document in modern history. It reveals why the Illuminati created Hitler and then sought to destroy him, and why Stalin made a pact with Hitler in 1939. Christian Rakovsky was a veteran Communist insider. Born Chaim Rakeover in 1873, he studied medicine in France before becoming a revolutionary. He was the leader of a terror group that attacked government officials. In 1919, Lenin put him in charge of the Soviet Ukraine government. He successfully kept the area for the Bolsheviks during the Civil War. Stalin appointed him Russian ambassador to Paris in 1925. Rakovsky belonged to the powerful Trotskyite faction that took their orders from the Rothschilds. Many of this group were shot in Stalin's 1937 Communist Party purge. The circumstances of the midnight interrogation Jan. 26, 1938 were very dramatic. What could Rakovsky possibly say to save his life? Rakovsky appears to use the tactic of "deceiving with the truth." He wins trust by revealing the truth but leaves some of it out. He tries to impress his interrogator that he and Trotsky represent an invincible power he calls the "Capitalist-Communist Financial International." He confirms that the "revolutionary movement" was designed to enlist support by pretending to serve mankind's moral and collective ideals. The real aim however is to give total world power to the bankers by dividing society and undermining established authority. "Revolution" really means, "overturning" Western civilization. "Christianity is our only real enemy since all the political and economic phenomena of the bourgeois states are only its consequences," Rakovsky, says. Peace is "counter-revolutionary" since it is war that paves the way for revolution. Rakovsky, whose tongue was loosened by a mild inebriant in his wine, refers to the Illuminati as "they" or "them." He is a member although not part of the inner circle. "the second anti-Christian conspiracy of that era, gnosticism." The interrogator was one of Stalin's cleverest agents, Gavriil Kus'min known as "Gabriel." Apart from him and a hidden sound technician, a doctor Jose Landowsky was the only other person present. Conscripted by the NKVD to help "loosen the tongues of detainees," Dr. Landowsky was sickened by the many tortures he witnessed. The interrogation of Rakovsky, however, was cordial. Dr. Landowsky doubts if the mild euphoric he put in Rakovsky's drink had much effect. The interrogation, conducted in French lasted from midnight until 7 a.m. After, Kus'min ordered Landowsky to translate the interview into Russian and make two copies. The content was so mind boggling that Landowsky made an additional carbon for himself. "I am not sorry that I had the courage for this," he wrote. A Spanish Fascist volunteer later found the manuscript on Landowsky's dead body in a hut on the Petrograd front during World War Two. He took it back to Spain where it was published as "Sinfonia en Rojo Mayo." in 1949. The complete text of "The Red Symphony" was put online by Peter Myers. The transcript was published in English in 1968 as "The Red Symphony: X-Ray of Revolution." You can find it in Des Griffin's "Fourth Reich of the Rich." (1988) I recommend this book and everything this fine man has written. Rakovsky gives his interrogator an astonishing inside view of modern history in order to prove that his sponsors control the world. "Money is the basis of power," Rakovsky says, and the Rothschilds manufacture it thanks to the banking system. The "Revolutionary Movement" was an attempt by Meyer Rothschild and his allies to protect and extend this monopoly by establishing a totalitarian New World Order. Lionel's son Nathaniel (1840-1915) needed to overthrow the Christian Romanoff Dynasty. Leon Trotsky was supposed to become the leader of the USSR. Trotsky, a Jew, married the daughter of one of Rothschild's closest associates, banker Abram Zhivotovsky and became part of the "clan." Unfortunately "national" Communists like Lenin (one-quarter Jewish) got in the way. Lenin overruled Trotsky and made peace with Germany (Treaty of Brest Litovsk, 1918.) This was not the Rothschild's plan. World War One was supposed to end the way the Second World War did. Russia was supposed to overrun Germany in 1918 and assist local "revolutionaries" in establishing a "peoples' republic." Trotsky was responsible for an attempt to assassinate Lenin in 1918 but Lenin survived. When Lenin had a stroke in 1922, Trotsky had Levin, Lenin's Jewish doctor, finish him off. At this critical moment, the unexpected happened. Trotsky got sick and Stalin was able to take power. At this crucial juncture, the Trotskyites pretended to support Stalin and infiltrated his regime in order to sabotage it. Rakowsky characterizes Stalin as a "Bonapartist," a nationalist as opposed to an International Communist like Trotsky. In order to control Stalin, international finance was forced to build up Hitler and the Nazi party. Rakowsky confirms that Jewish financiers backed the Nazis although Hitler was not aware of this. Our aim was to provoke a war and Hitler was war...[the Nazis] received...millions of dollars sent to it from Wall Street, and millions of marks from German financiers through Schacht; [providing] the upkeep of the S.A and the S.S. and also the financing of the elections..."
Unfortunately for the bankers, Hitler also proved intractable. He started to print his own money! Are you capable of imagining what would have come ...if it had infected a number of other states and brought about the creation of a period of autarchy [absolute rule, replacing that of the bankers]. If you can, then imagine its counterrevolutionary functions..."
Hitler had become a bigger threat than Stalin, who had not meddled with money. Rakovsky's present mission was to convince Stalin to make a pact with Hitler and turn Hitler's aggression against the West. The purpose was for Germany and the Western nations to exhaust each other before another front was opened in the East. Rakovsky urged the Russians to use the tactic of "deceiving with the truth." The Russians were to impress Hitler with their genuine desire for peace. Hitler was not to suspect that he was being set up for a war on two fronts. Stalin was given a choice. If he agreed to divide Poland with Hitler, the West would declare war on only one aggressor, Germany. If he refused, the bankers would allow Hitler to depose him. Kus'min demanded some high level confirmation. Rakovsky told him to see Joseph Davies, the US ambassador in Moscow, a fellow Freemason and representative of the International Communist Roosevelt administration. Someone was sent to Davies who confirmed that "much would be gained" if Rakovsky got an amnesty. On March 2, 1938, a powerful radio message was sent to Moscow in the cipher of its London embassy. "Amnesty or the Nazi danger will increase," it said. Davies attended Rakovsky's trial and gave him a Masonic greeting. On the same day, March 12, 1938, Hitler marched into Austria. Rakovsky's death sentence was commuted. Some believe he lived out his years under an assumed name. Another source has him shot in 1941. Secret negotiations were begun with Hitler. The result was the Ribbentrop-Molotov pact signed in August 1939 just one week before the invasion of Poland. The interrogation seems to have created an accord between Stalin and the Illuminati. Europe and the United States long ago succumbed to Rothschild Illuminati control. In Russia, there are still some death spasms. Recently, Vladimir Putin arrested Mikhail Khordordovsky, the head of Russia's largest oil company "Yukos" and "the richest man in Russia." Putin announced that Russia would seize his $12 billion 26% stake in the oil company, one of many national assets plundered in the reorganization of Communism 15 years ago. Then we learn the shares already had passed to none other than banker Jacob Rothschild under a "previously unknown arrangement" designed for such a circumstance. The two have known each other for years "through their mutual love of the arts." Rakovsky told Kus'min that the Illuminati never take political or financial positions. They use "intermediaries." Obviously Khodordovsky is an "intermediary" for Rothschild. So are Richard Perle, Henry Kissinger and Ariel Sharon who each spoke out against Putin's action. Perle, the architect of the Iraq war, called for the expulsion of Russia from the Group of Eight. Sharon expressed concern about "persecution of Jewish businessmen." Khodordovsky is Jewish as is Simon Kukes his successor. And Perle and Kissinger. Many Jews serve the Illuminati and that is a cause of anti-Semitism. But Tony Blair and George W. Bush serve it too and are not Jewish. The membership of the Bilderbergers and the Skull and Bones is mostly not Jewish. The Illuminati is an alliance between the Rothschilds, and the world's super rich united by Freemasonry, whose God is Lucifer. Mankind, God's magnificent experiment, has been subverted and compromised. From the U.S. soldier in Iraq, to the taxpayer who pays the national debt, we are all "men of straw." "have to die at the hands of the revolution which has been brought about with their cooperation," according to C.G. Rakovsky, a founder of the Communist International. "The real secret of masonry is the suicide of Freemasonry as an organization, and the physical suicide of every important mason." "It is clear that I know of this not as a Freemason, but as one who belongs to 'Them,'" [the Illuminati] says Rakovsky, a colleague of Leon Trotsky arrested for plotting against Stalin. Rakovsky's aim is to convince Stalin, a nationalist, to cooperate with the "the Communist-Capitalist International." I introduced this document last week in my "Rothschilds Conduct 'Red Symphony' " where the Internet location of this document is given. Who and what is in a position to overthrow an invisible force?" "we shall create and multiply free Masonic lodges... absorb into them all who may become or who are prominent in public activity, for in these lodges we shall find our principle intelligence office and means of influence.... The most secret political plots will be known to us and will fall under our guiding hands...We know the final goal...whereas the goyim have knowledge of nothing..."
In his interrogation, Rakovsky says that millions flock to Freemasonry to gain an advantage. "The rulers of all the Allied nations were Freemasons, with very few exceptions." "create all the required prerequisites for the triumph of the Communist revolution; this is the obvious aim of Freemasonry; it is clear that all this is done under various pretexts; but they always conceal themselves behind their well known treble slogan [Liberty, Equality, Fraternity]. You understand?" Masons should recall the lesson of the French Revolution. Although "they played a colossal revolutionary role; it consumed the majority of masons..." Since the revolution requires the extermination of the bourgeoisie as a class, [so all wealth will be held by the Illuminati in the guise of the State] it follows that Freemasons must be liquidated. The true meaning of Communism is Illuminati tyranny. "the expression of stupidity on the face of some Freemason when he realizes that he must die at the hands of the revolutionaries. How he screams and wants that one should value his services to the revolution! It is a sight at which one can die... but of laughter!" Like masons, other applicants for the humanist utopia master class (neo cons, liberals, Zionists, gay and feminist activists) might be in for a nasty surprise. They might be tossed aside once they have served their purpose. When the interrogator presses Rakovsky for Illuminati notables to approach with an initiative, Rakovsky is sure of only two who are now deceased: Walter Rathenau, the Weimar foreign minister, and Lionel Rothschild. He says Trotsky is his source of information. "As an institution, the bank of Kuhn Loeb & Company of Wall Street: [and] the families of Schiff, Warburg, Loeb and Kuhn; I say families in order to point out several names since they are all connected ... by marriages; then Baruch, Frankfurter, Altschul, Cohen, Benjamin, Strauss, Steinhardt, Blom, Rosenman, Lippmann, Lehman, Dreifus, Lamont, Rothschild, Lord Mandel, Morganthau, Ezekiel, Lasky.... any one of the names I have enumerated, even of those not belonging to "Them" could always lead to "Them" with any proposition of an important type." By allowing bankers the privilege of creating money, we have created an insatiable vampire. If you could manufacture money, imagine the temptation to own everything! Rakovsky refers to the 1929 Crash and Great Depression as an "American revolution." It was deliberately precipitated by the Illuminati for profit, to break the "classical American," and to take political power. "The man through whom they made use of such power was Franklin Roosevelt. Have you understood? ...In that year 1929, the first year of the American Revolution, in February Trotsky leaves Russia; the crash takes place in October... The financing of Hitler is agreed in July, 1929. You think that all this was by chance? The four years of the rule of Hoover were used for the preparation for the seizure of power in the United States and the USSR: there by means of a financial revolution, and here [Russia] with the help of war [Hitler, World War Two] and the defeat which was to follow. Could some novel with great imagination be more obvious to you?" Rakovsky proposes that Stalin cooperate with the Illuminati, (which he subsequently did.) The first condition is that he stops executing Trotskyites. Then "several zones of influence" will be established dividing "the formal Communism from the real one." "mutual concessions for mutual help for a time while the plan lasts... There will appear influential persons at all levels of society, even very high ones, who will help the Stalinist formal Communism..."
Rakovsky outlines the Illuminati plan to blend Communism and Capitalism. In each case, the Illuminati will control all wealth and power. "In Moscow there is Communism: in New York capitalism. It is all the same as thesis and antithesis. Analyze both. Moscow is subjective Communism but [objectively] State capitalism. New York: Capitalism subjective, but Communism objective. A personal synthesis, truth: the Financial International, the Capitalist Communist one. 'They.' "
The Red Symphony confirms that our political and cultural leaders are mostly dupes or traitors. The subversion of the United States is part of a plan for world tyranny. I have not discovered all the components. People urge me to research the Vatican and the Jesuits, and I will. But obviously an occult cabal of bankers and other wealthy people is bent on enslaving humanity. Many are Jews who seem to be following the primitive Talmudic injunction to rule the world and usurp all its wealth, as outlined in The Protocols. 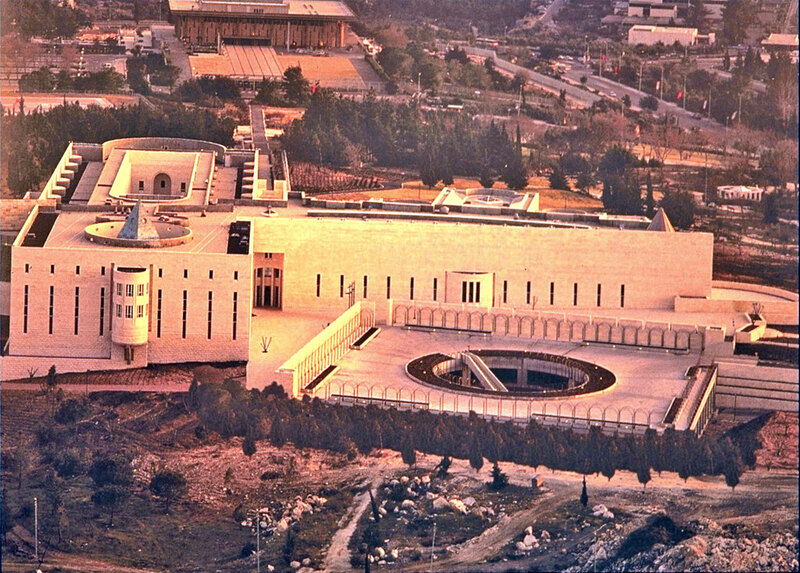 A manifestation of the Rothschild's emerging Luciferian tyranny based in Jerusalem is the Masonic design of the new Israeli Supreme Court building (below image). Most Jews are not party to this plan, would oppose it, and are themselves victims of it. Anti Semitism is used to distract us from the real issue, the creation of a global police state dedicated to projecting Illuminati wealth. The "war on terror" is about establishing this authoritarian control. What are they planning that requires it? Another Great Depression? Another "terrorist" attack? Sept. 11 demonstrates they will slaughter innocent Americans without compunction. Under the Satanic dispensation, everyone is duped. We are spoiled, distracted, unsexed and frivolous. Like Freemasons, we are lambs led to slaughter.